In the olden days, some of us remember a knife sharpener walking through our neighborhood wheeling a cart and ringing a bell. As fast as we kids would run when we heard the Skippy Ice Cream Man, our parents would run to grab our kitchen knives when they heard the bell. Those days are over, but we have the next best thing: Jim the Knife Guy from Edge of Knife. 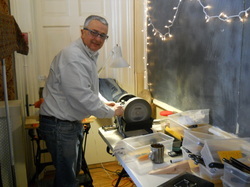 He is a traveling knife sharpener and we are lucky to have him join us the first Saturday of the month from 9am-noon. He brings a variety of knife sharpening machines and tools. If you get there early he will sharpen your kitchen knives while you shop at the market, if not you may have to come back after noon. His prices are reasonable and well worth it when you slice through your tomatoes and dice your veggies like a pro. Working in the kitchen with a sharp knife truly makes preparing delicious foods from scratch a pleasure and has actually inspired many a creative dish. Get your knives ready and mark your calendars: Feb 7, March 7, April 4 and May 2, 2015.